I must admit, before watching 'Los Lobos: Kiko Live,' the only familiarity I had with the celebrated Chicano rock band was through their contributions to the Richie Valens biopic, 'La Bamba.' That being the case, whenever I thought of their music, I couldn't help but hear that irritatingly catchy Mexican classic replay endlessly in my mind. Thankfully, after watching this disc, that will no longer be the case. It turns out the band's talents extend far beyond that single track, and their music is an interesting blend of a variety of different styles. Fusing rock, Tex-Mex, blues, and folk, the group comes away with a pretty unique sound. For this concert, the band plays one of their most acclaimed albums, "Kiko," rocking the stage with a solid performance that displays wide musical range and skill. Filmed on February 24, 2006 at the House of Blues in San Diego, CA, the concert features the complete 1992 sixteen track "Kiko" album played in its entirety. Band members David Hidalgo, Louie Perez, Cesar Rosas, Conrad Lozano, and Steve Berlin all take to the stage, and while the musicians aren't the most dynamic performers (they basically just stand still and play), they have decent stage presence and a cool, relaxed charisma. Standard concert coverage is employed, capturing the show from an assortment of angles. Pans, cranes, and even some split screen shots are used to add visual variety. All the while, the stage is soaked in deep blues, reds, greens, and purples, enhancing the music through moody atmosphere. At first, I wasn't particularly impressed with the band's style, as the initial tracks have a fairly generic sound to them. Thankfully, things start to grow more diverse with the third song, "Angels with Dirty Faces," and from there the album goes on to develop an eclectic and interesting sound. Traditional rock instruments (guitars, bass, and drums) are combined with a keyboard, saxophone, maracas, and on some tracks, even an accordion and harp, lending the music a unique, faintly dreamlike texture that blends classic rock with Mexican, folk, and even psychedelic elements. The band also does a nice job of balancing softer tracks with more fast-paced efforts, keeping the momentum of the concert fresh. Highlights include renditions of "Kiko and the Lavender Moon," "Saint Behind the Glass," "When the Circus Comes," "Two Janes," and a rousing interpretation of "Rio de Tenampa" that closes the concert. Interspersed throughout the songs, are interview segments with the band members and the album's original producers and mixers chronicling the group's formation, evolving sound, and the creation of the "Kiko" album. Some individual songs are discussed in detail, with the group describing their origins, inspirations, and meanings, while elaborating on their writing process. Some fly-on-the-wall footage of the group jamming together is also included. The members are all laid-back and very open, sharing various anecdotes and tidbits that are sure to please fans while simultaneously bringing the uninitiated (like myself) up to speed on their history. While the concert and interviews are good on their own, the way the filmmakers blend them together can be a little clunky and unrefined, breaking up the flow of the album. Likewise, even when performances don't lead directly into interviews, the concert will often fade to black before coming in for the next track. This editing style disrupts the natural progression of the show, and while I understand that bits between tracks probably needed to be cut for time, there are other ways to handle these transitions that would have flowed much better. The interview material itself also has a slightly amateur quality, but the low budget style fits well with the more informal demeanor of the group. 'Los Lobos: Kiko Live' presents a great performance of the band's defining album, complete with some interesting interview material peppered throughout. Some of the editing between the different segments and tracks can be a little clunky, but that's relatively minor nitpick for an otherwise successful presentation. I still can't say that I'm a huge admirer of the band, but I've definitely developed a strong appreciation for their style and talent (and now finally have their version of "La Bamba" out of my head). Fans of the group should not hesitate to pick this up, and even those who aren't familiar with Los Lobos might want to take a look. 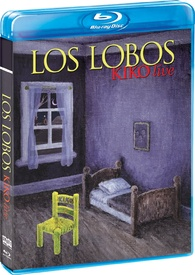 Shout Factory brings 'Los Lobos: Kiko Live' to Blu-ray on a BD-25 disc housed in a keepcase. A bonus audio CD of the performance is also included. An option in the menu allows viewers to watch a concert only version of the film which skips over all of the interview material with the band. After some logos and warnings, the disc transitions to a standard menu. The movie is provided with a 1080p/AVC MPEG-4 transfer in the 1.78:1 aspect ratio. While the actual concert material looks quite nice, some of the interview footage leaves a lot to be desired, leading to an uneven presentation. For the concert footage, the digital source is mostly clean, but noise is visible periodically. Detail is nicely resolved with decent pop and depth. The lighting design of the show washes the stage in deep blues, greens, reds, and purples, and all of the colors are vividly rendered with pleasing saturation. Contrast is well balanced and shadow delineation is solid. Unfortunately, the interview material interspersed throughout the concert is another matter altogether. This footage appears to come from a lower grade, possibly upscaled source, and is home to some noticeable artifacts. Aliasing, noise, and other anomalies are visible, and the material suffers from lackluster clarity and a flat, dull appearance. With the shift in quality between concert and interview footage, the video transfer can be a bit manic. Still, the musical performance is the real highlight, and thankfully that material looks pretty nice. The film is presented with an English DTS-HD MA 5.1 track and a PCM 2.0 track. Full, spacious, and crisp, the music sounds fantastic, offering a very pleasing and authentic concert experience. Vocals are clean and well prioritized, coming through with strong fidelity and resonance. With that said, the singing isn't relegated to the center speaker alone, and mostly comes from the left and right channels. The various instruments carry a distinct, rich quality and there is nice separation across the soundstage. Surrounds are primarily used for applause and other crowd reactions, but music cues do bleed to the rears as well. One of the most impressive aspects of the mix is the track's deep bass response. Low frequencies provide an aggressive and wonderfully balanced experience that gives a natural, full-bodied kick to the tracks. Dynamic range is wide, providing a lovely sense of variety and auditory dimension. The interview material is rather basic in presentation, but the dialogue comes through well (though, from the left and right channels, not the center speaker). Crisp and deep, 'Los Lobos: Kiko Live' sounds fantastic. The presentation isn't quite reference quality, but it's a very strong concert disc that should certainly please fans. Shout Factory has provided a decent assortment of supplements including additional songs and interviews. All of the extras are presented in 1080i with DTS-HD MA 5.1 sound and no subtitles. Encore Performances (HD) - Three additional songs from the concert are viewable separately or together. The encore tracks are: "Carabina 30-30," "Volver Volver," and… "La Bamba." So much for getting that track out of my head. Bonus Vignettes (HD) - Three additional interview segments are viewable together or separately. "Hi-Fi Low-Fi" (3 min) details the band's unique sound. "The Story of La Bamba" (6 min) focuses on the group's interpretation of the classic Mexican song and then goes into a montage of stills set to music. "The Music Reveals Itself" (4 min) features the band members reminiscing about their introduction to music and their favorite bands. 'Los Lobos: Kiko Live' offers a very solid concert performance from the Chicano rock band. With an interesting mixture of influences, the group has a unique sound, and the interview material offers some interesting insights into the band's formation and creative process. The video transfer is a little uneven, but the audio mix is fantastic. Some encore tracks and bonus interviews round out the package, capping off a very worthwhile release that should please longtime fans and even those new to the band.